Cloudywinged whitefly, Singhiella citrifolii (Morgan), is one of the most common whiteflies associated with citrus in Florida. A native of Asia, it was described by Morgan in 1893 and later by Berger in 1909 from specimens collected in Florida. This species occurs in Barbados, Brazil, Bermuda, China, Cuba, Hong Kong, Jamaica, Japan, Malaysia, Puerto Rico, Trinidad, Venezuela, Vietnam, and the United States (Arkansas, Florida, Louisiana, North Carolina, Texas) (Mound and Halsey 1978). Adults: The adults are very small, yellowish, with a cloudy spot on the apex of the forewing, and dusted with white powdery wax. When at rest the wings are laid back against the abdomen. Males are smaller than females, with the mean body length 1.28 mm for females and 1.04 mm for males (Quaintance and Baker 1917). Figure 1. Adult cloudywinged whiteflies, Singhiella citrifolii (Morgan). Photograph by R. Nguyen, Division of Plant Industry. Pupae: Pupae are oval, flattened, membranous, and yellowish-green without an orange spot on the back. The pupal case is opaque after emergence of the adult and the case may collapse and lose its shape. Singhiella citrifolii pupae are readily confused with Dialeurodes citri, the citrus whitefly, but Singhiella citrifolii is said to be somewhat larger (Hamon 2001). Nymphs: The immature stages are flat, elliptical in shape and light yellowish in color, and prefer the underside of the leaf. Three larval and one pupal stage occur in the life cycle. The first stage is 0.31 mm long and 0.20 mm wide, second stage 0.58 mm long and 0.38 mm wide, third stage 0.88 mm long and 0.66 mm wide, and pupa (4th stage) 1.44 mm long and 1.09 mm wide (Peracchi 1971). Figure 2. Immature stages of the cloudywinged whitefly, Singhiella citrifolii (Morgan). Photograph by Division of Plant Industry. Eggs: The eggs are tiny (0.25 mm long), brown, elliptical elongate in shape and most commonly laid on young leaves. 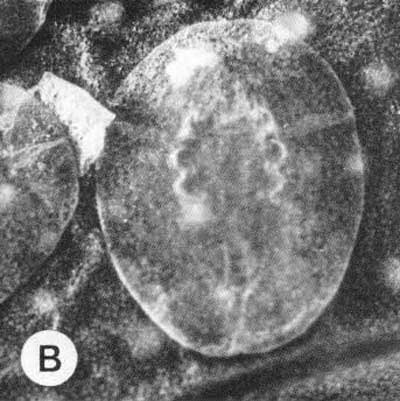 The eggs can readily be separated from Dialeurodes citri because Singhiella citrifolii eggs are dark brown and have a hexagonal pattern on the surface, while Dialeurodes citri eggs are lighter in color and nearly smooth (Hamon 2001). Figure 3. 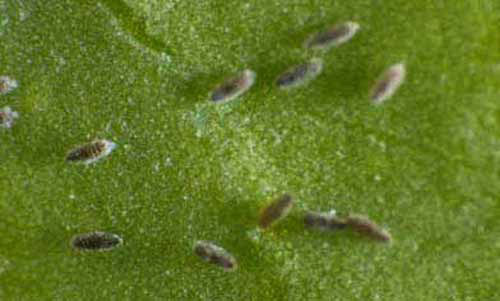 Eggs of the cloudywinged whitefly, Singhiella citrifolii (Morgan). Photograph by R. Nguyen, Division of Plant Industry. The life cycle from egg to adult ranged from 51 to 334 days with three generations per year in Florida (Morrill and Back 1911). 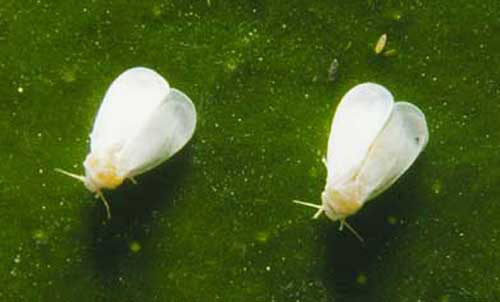 The whitefly damages citrus by sucking sap from the leaves. Also, honeydew excreted is a medium for the growth of sooty mold fungi. The sooty mold can cover the fruit and foliage so that it interferes with photosynthesis, and requires that fruit be washed before marketing. In 1977, Encarsia lahorensis became established in Florida, and by 1980 had suppressed the population of Dialeurodes citri (Nguyen and Sailer 1979, Sailer et al. 1984). Since then, Singhiella citrifolii has gradually replaced Dialeurodes citri on citrus in central and southern Florida. Citrus is the most important host of this species. However, it can be found on Ficus nitida (Morrill and Back 1911) and Gardenia sp. Parasites: Encarsia pertrenua (Silvestri) (reported in Vietnam) and Encarsia sternua (Silvestri) reported in Macao) (Silvestri 1927, Fulmex 1943). Predators: a lady beetle Delphatus catalinae Horn (Mound and Halsey 1978). 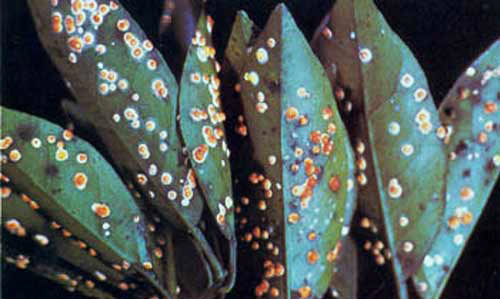 Pathogens: Aschersonia aleyrodis Webber, Aschersonia flavo-citrina B. Henning, and Aegerita webberi Fawcett (Pratt 1958). Aschersonia aleyrodis (red aschersonia) is the most common pathogen on D. citrifolii in central and southern Florida. Figure 5. 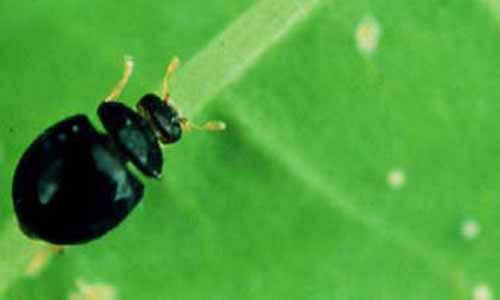 Adult coccinellid predator of whitefly nymphs, Delphastus catalinae. Photograph by Kim Hoelmer, USDA. Figure 6. Red, Aschersonia aleyrodis, and yellow, Aschersonia goldiana, Aschersonia fungi attacking immature whiteflies. Photograph by University of Florida. 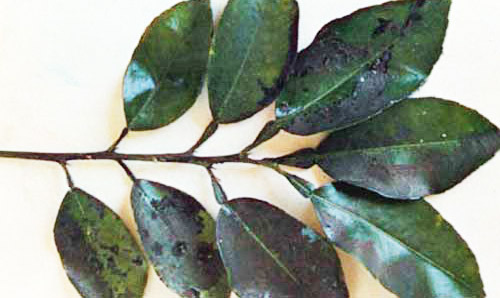 Whiteflies also are controlled by sprays applied primarily for control of scale insects. Spraying of commercial citrus exclusively for whitefly control is seldom practiced in Florida. Berger EW. 1909. Whitefly studies in 1908. Florida Agricultural Experiment Station Bulletin 97: 43-97. Fulmex L. 1943. Virtsindex der Aleyrodiden - und Cocciden-parasiten. Entomol. Beih. Berl. Bahlem. 10: 30. Hamon AB. (1 May 2001). Whitefly of citrus in Florida. Division of Plant Industry, FDACS. http://www.freshfromflorida.com/pi/enpp/ento/aleyrodi.html (nolonger online). Jensen AS. 2001. A cladistic analysis of Dialeurodes, Massilieurodes and Singhiella, with notes and keys to the Nearctic species and description of four new Massilieurodes species. Systematic Entomology 26: 279-310. Morgan HA. 1893. Aleyrodes citrifolii. pp. 70-74. In Stubbs WC, Morgan HA. The orange and other citrus fruits from seed to market, with insects beneficial and injurious with remedies for the latter. Special Bulletin of the Louisiana State Experiment Station. Morrill AW, Back EA. 1911. Whiteflies injurious to citrus in Florida. U.S.D.A. Bureau of Entomology Bulletin 92: 1-109. Mound LA, Halsey SH. 1978. Whitefly of the World. A systematic catalogue of the Aleyrodidae (Homoptera) with host plant and natural enemy data. British Museum of Natural History, Chichester. 340 p.
Nguyen R, Sailer RI. 1979. Colonization of a citrus whitefly parasite, Prospaltella lahorensis, in Gainesville, Florida. Florida Entomologist 62: 59-65. Peracchi AL. 1971. Dois Aleirodideos pragas de Citrus no Brazil (Homoptera: Aleyrodidae). Rio de Janeiro Mus. Nat. Archivos 54: 145-151. Pratt RM. 1958. Florida guide to citrus insects, diseases and nutritional disorders in color. Florida Agricultural Experiment Station 191 p.
Quaintance AL, Baker AC. 1917. A contribution to our knowledge of the whiteflies of the subfamily Aleyrodinae (Aleyrodidae). Proceedings of the U.S. National Museum 51: 335-445. Sailer RI, Brown RE, Munir B, Nickerson JCE. 1984. Dissemination of the citrus whitefly (Homoptera: Aleyrodidae) parasite Encarsia lahorensis (Howard) (Hymenoptera: Aphelinidae) and its effectiveness as a control agent in Florida. Bulletin of the Entomological Society of America 30: 36-39. Originally published as DPI Entomology Circular 275. Publication Date: June 2001. Latest revision: September 2007.